Make sure you visit Kristin & Christy for their thoughts on today’s topic, as well as our guest TIPster Jillian from Hi! It's Jilly. As I've mentioned before, our family eats very simply, so almost all of our meals would be considered quick and easy. I love how planning and preparing the same simple meals frees up some time for making more food from scratch. If I spent more time making dinner every night I'd probably be overwhelmed by the thought of cooking my own dried beans, preparing fresh milk kefir daily, picking a year's worth of blueberries to freeze, making vegetable broth, and baking soaked whole wheat sandwich bread. Most definitely, I'd be discouraged about trying to find time to tend to our own organic, pasture raised chickens. So for our family the trade off is very much worth it (and my husband agrees). But, during the summer my dinner plan gets even easier. Most nights during the summer our family enjoys a delicious main dish salad. I try to add some type of protein, which for our family typically means cooked chicken or beans, although nuts and hard boiled eggs are sometimes scattered on top of our fresh veggies. While I love salads at restaurants, sometimes eating a salad at home can get a little boring. We've found that having lots of different veggies and a variety of toppings and dressings can help break up the boredom. I've been experimenting with homemade dressings and I'm dreaming of having several dressings mixed up in mason jars and stored in the fridge for salad duty rotations. A few years ago we hosted a blog link up for salad recipes, but recently I've been turning to Pinterest for some ideas to freshen up our salads. 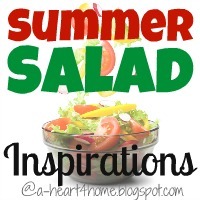 So today, I'm sharing my top 10 Summer Salad inspirations. Now, let's face it, some salads require a lot of chopping which cuts down on their quick and easy label, so I often pre-chop a large number of veggies at one time and store them in the fridge. At the very least I like to get everything chopped up during naptime so the before dinner scramble doesn't catch me by surprise. And remember these are inspirations, salads aren't an exact science, so feel free to substitute what you have in the garden or already in your fridge to make these salads work for your family. our guest TIPster, Jillian @ Hi! It's Jilly.